Take advantage of this freebie! 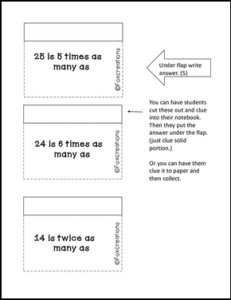 Give your students extra practice in interpreting a multiplication equation as a comparison, e.g., interpret 35 = 5 × 7 as a statement that 35 is 5 times as many as 7 and 7 times as many as 5. This freebie comes with 2 printable worksheets and 2 pages of interactive notebook material and/or as an interactive activity. Use this freebie for homework, morning work, quick checkup, center work, partner work, small group, or even during math intervention. 1. Go to your My Purchases page. 2. Click on Provide Feedback for the item. 3. Give a rating and a comment—even a short one.Each time you leave feedback, TpT gives you Feedback Credits that you can apply toward future purchases. It takes just a few seconds!